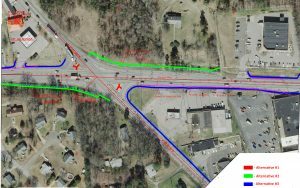 The Town of Hillsborough selected DAVENPORT to determine the feasibility of installing pedestrian facilities along NC 86 (Churton Street) and US 70 Bypass (Cornelius Street) and recommend alternatives for further study and eventual construction. For the 1,400-foot section along NC 86, DAVENPORT looked at two alternatives and recommended one that would install five-foot-wide sidewalk with a variable-width planting strip on the east side of the road. This alternative allows for construction within existing right-of-way and around existing utilities, and provides a safe offset for pedestrians. DAVENPORT’s recommendations also included access management to eliminate or reduce the width of numerous commercial driveways, which would further improve pedestrian safety along the corridor. Along the more topographically challenged US 70 Bypass section, DAVENPORT evaluated three alternatives and recommended a fourth—a hybrid of the other three. For this 1.5-mile-long section, DAVENPORT recommended installing shoulder sections with sidewalk, curb and gutter sections with sidewalk, and sections of sidewalk located behind a guardrail in areas that do not sit back far enough from the roadway to meet clear-zone requirements. The recommended alternative maximizes aesthetics with the strategic location of curb and gutter and makes use of existing right-of-way and sidewalk where possible. Balancing cost minimization with the competing priorities of aesthetics and safety was particularly challenging, but DAVENPORT’s roadway design knowledge helped the team devise workable, constructible solutions. Right away, the team uncovered a cost-saving opportunity for the study phase by eliminating the need for full surveys. DAVENPORT used lower-cost tools such as aerials and GIS to provide the level of accuracy needed for the feasibility stage while keeping the study within budget. The firm evaluated each alternative from a cost perspective and, in the end, divided the recommended alternatives into phases, with the understanding that the Town receives grant money in $100,000 increments. DAVENPORT’s cost-minimization strategies, roadway design perspective and close collaboration with the Town helped to ensure the final report included constructable recommendations and reflected the Town’s vision and voice.